The Goths (Gothic: , Gutans) were an East Germanic tribe. They spoke the Gothic language. Jordanes was a scholar from the 6th century who wrote a summary of a twelve volume work by Cassiodorus about the Goths. Jordanes work is commonly called Getica. The original work by Cassiodorius was lost, Getica is the only surviving contemporary account about the Goths. According to this book they left Scandinavia via Gotland and settled close to the mouth of the Vistula river (in present day Poland). In the 3rd and 4th centuries they settled Scythia, Dacia and parts of Moesia and Asia Minor. 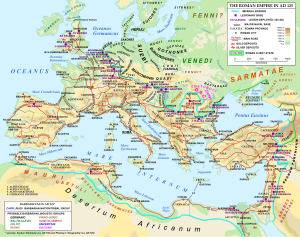 In the 3rd and 4th centuries, they fought with the Roman Empire and later adopted Arianism (a form of Christianity). In the 5th and 6th centuries, they split into the Visigoths and the Ostrogoths. With this move, they established powerful successor-states of the Roman Empire in Italy and on the Iberian peninsula (now Spain & Portugal). Traces of Gothic blood can be found in many people .